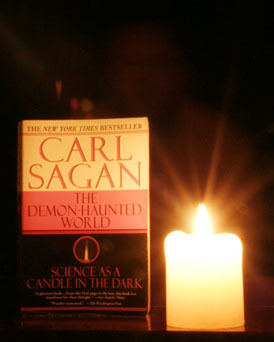 The Demon-Haunted World: Science as a Candle in the Dark is probably the most well-known of Carl Sagan’s books, and is almost considered a handbook of skepticism and critical-thinking. It’s hard to say whether this was intentional or not – Sagan was always a huge promoter of critical thinking, but by its own admission it is a science book. From my standpoint, however, it should be recommended reading for anyone with a teen reading level onward, regardless of one’s views towards science, or even their misgivings about it. In only one place does the science that Sagan enthuses over actually involve something like equations, and he’s patient enough to explain them without forcing the reader to comprehend the values – this is about James Clerk Maxwell’s sudden discovery, through what was really a mathematical experiment, of the nature of electromagnetism and its relation to light and radio waves. “Relation” being rather the wrong word here, since at that point they were found to be the same thing, a discovery that has enormous impact on everything we do today. More compelling, however, is Sagan’s examination of our everyday world. He builds his cases carefully, keeping the reader captivated with concise writing as he gently steers to his target by eliminating the other choices. Sagan, especially in this book, is a humble yet enthusiastic writer, who asks more questions than he answers, yet asks the right ones, never telling the reader what must be the case yet allowing them to eliminate the other options. In this regard, he mimics one aspect of the scientific method, in that he tries to determine if any other conclusion might fit as well, if not better, which would throw the initial conclusion into doubt. In this way, science tests itself and weeds out alternative explanations. To me, the most distinctive parts of the book are where he examines the witch hunts of Europe before the Enlightenment, chronicled through writers of that time. If, like me, you knew only of Salem during that period, these chapters will be shocking – Salem was a drop in the bucket in a time of senseless and inescapable persecution, based on a corrupt belief system and meaningless assertions. We’d like to think we know better now, but Sagan manages not to couch it in terms of past ignorance, but compares it with present assertions, demonstrating that we are not immune to such behavior unless we make the efforts to ask the hard questions and demand support for claims. Indeed, he makes direct comparisons to alien abduction accounts and the questionable methods of investigating such. Sagan goes into great detail regarding the famous abduction case of Betty & Barney Hill, relating facts that most accounts somehow miss. These facts, far from being extraneous, have direct bearing on the reliability of the testimonies, and provide an eye-opening experience into the world of UFO investigation. It becomes evident that some conclusions are reached not through weight of the evidence, but by other means – wish fulfillment, perhaps, or pre-existing biases. And while many people find no surprise at this, Sagan takes pains throughout the book to demonstrate that such behavior does not belong to “fringe” beliefs alone. Another fascinating read are the samples of public opinion, snippets of responses he had received in the mail following the publication of chapter excerpts in Parade magazine. If the reader is still dubious about the need for thinking skills in this modern age, this cross-section of American opinion certainly helps drive the point home. The responses from a high school classroom are particularly disturbing. It’s one thing to hear, or even believe oneself, that much of the public is ill-informed, but seeing the examples of it always has a greater impact. [From pg 214] My favorite example is this story, told about the Italian physicist Enrico Fermi, newly arrived on American shores, enlisted in the Manhattan nuclear weapons Project, and brought face-to-face in the midst of World War II with U.S. flag officers. So-and-so is a great general, he was told. What is the definition of a great general? Fermi characteristically asked. I guess it’s a general who’s won many consecutive battles. After some back and forth, they settled on five. What fraction of American generals are great? After some more back and forth, they settled on a few percent. But imagine, Fermi rejoined, that there is no such thing as a great general, that all armies are equally matched, and that winning a battle is purely a matter of chance. Then the chance of winning one battle is one out of two, or 1/2; two battles 1/4, three 1/8, four 1/16, and five consecutive battles 1/32 – which is about 3 percent. You would expect a few percent of American generals to win five consecutive battles – purely by chance. Now, has any of them won ten consecutive battles …? Another striking thing about this book is the sheer number of places you can stop reading and contemplate an introduced idea. I have myself taken advantage of this with a blog post, and will likely do so again soon. Sagan is succinct, able to explain his point with clarity and without additional verbiage or redundancy, and thus covers a vast array of topics and ideas – so many that it’s impossible to do justice with a brief book review. I was struck with the thought that this could serve almost as a textbook, with work assignments or essays based on aspects of each chapter – and what a remarkable class that would be. If you are a “thinker,” this book is a buffet. Towards the end of the book, he apologizes for devoting a couple of chapters to politics, but even here Sagan cannot become polarized. The reader dreading the polemic of political parties today will find themselves cringing for nothing – Sagan instead details the careful considerations and knowledgeable backgrounds of our founding fathers, most notably Thomas Jefferson, and the efforts they put into crafting the documents that govern this country. The fact that this bears no resemblance whatsoever to our current political figures is damning all by itself, with no input given or necessary by Sagan. Carl Sagan had a couple of gifts: one of reasoned debate without rancor; and the other of boundless fascination with the natural world. Both are exemplified in this book, without ever leaving his message behind. My challenge to anyone is to simply read a chapter – any chapter. If you’re not convinced, I’ll turn in my book reviewing badge. And if your child is tackling reading at the level of Mark Twain or Edgar Allan Poe, they’re ready for this book. Okay, I went a little longer between posts than I prefer, due to several things, so it’s time to get back into it. In recognition of my absence, I give you a compositional element: empty space. A very basic goal in photography is simplicity – strive to include only the elements that help the photo and leave out anything extraneous. The idea is to give the viewer a strong focal point, and/or a strong message or impression, and nothing else to distract them. But the element I’m now talking about takes the concept one step further: you include a large hunk of nothing to convey its own message. This message can vary, but it’s important to know how to use it. In the example above, there’s a lot of space to the right of the frog. This provides multiple meanings. Primarily, it’s the space ahead. When you have either a moving subject or a line of sight from your subject, in this case the frog looking directly right, you provide this space ahead of the subject rather than “blocking it in” with the edges of the frame. Too close to the side of the image and you are, in a way, standing your subject in a corner, and it can be unsettling to the viewer. But it also implies distance in this case, leading to the idea that the frog is not merely looking right, but entirely across the river, and this is enhanced by the position atop the rock, high enough to have a good view, it would seem. While that empty space is not really empty, but instead very complicated and full of things, it’s also out of focus (more on how to achieve this can be found here.) This gives a greater feeling of distance while simultaneously minimizing the impact it has on the viewer – we can’t focus on it, so we’re simply not supposed to, and pay attention to the focused parts of the image. 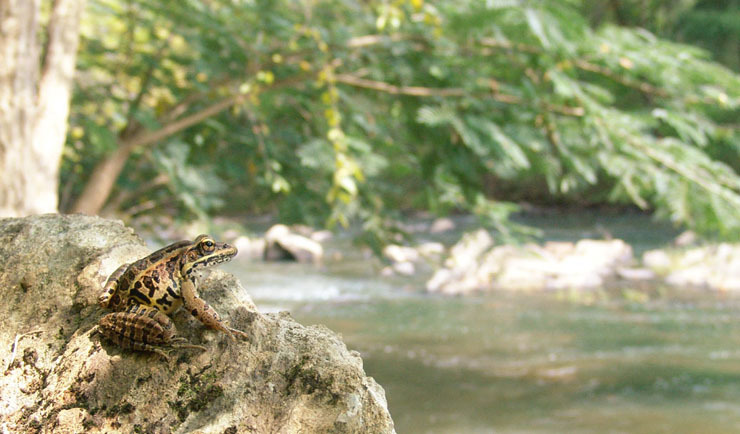 With this framing, this becomes not simply a photo of a frog, but the idea of the frog crossing the river, and the river as the setting also provides the goal. There are a couple of very subtle elements in here, too. Frogs obviously jump, but did you get the impression that the frog could jump across the entire river, or was perhaps contemplating it? There are two things that may have contributed to that feeling. The first is that the frog has a natural arc in its body, up and to the right, and this is even continued from the rock below it, in the light and pattern (and notice that we never thought the arc went in the opposite direction.) The second one is the arc of the background tree limb, mimicking the frog and drawing its own path across the river. While the frog could never jump that far, we are given the impression that it could. Sometimes, empty space is really empty, and doesn’t seem to say anything. But it does, if only, “There’s nothing around for miles.” The isolation implied by the blank water is as much a photo element as the main subject here, and provides contrast to the sharp, intense detail of the tree stump. The empty space counterbalances the stump in the photo, and the frame is actually split in half diagonally, with almost nothing but grey and white to the upper right, and all of the color and shade in the lower left. This lack of color, by the way, allows us to notice the tiny little green leaves atop the stump, where otherwise we probably could not have. 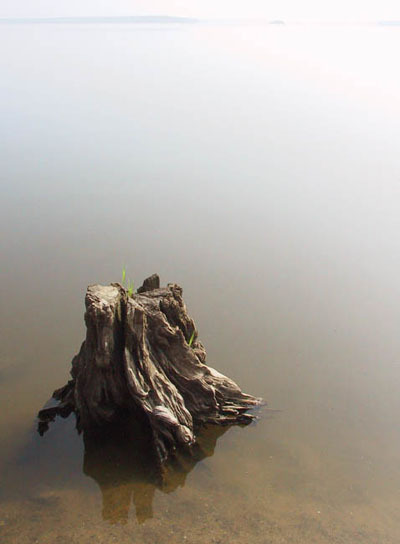 The image says, “morning;” it says, “quiet;” it says “lonely.” The texture of the stump is almost welcome against the emptiness, and the tiny new sprouts are a ray of hope, or even defiance. A couple of leaves aren’t anything to write home about, but they’re given emphasis by the juxtaposition of empty space. Life finds a crack and forces its way in. The featureless grey humps of the opposite shoreline are almost extraneous, and could simply be cropped out, but they add a greater sense of distance. They’re so subtle they nearly escape attention, and (unlike the bright rocks to the right of the frame in the frog photo at top) they do not distract at all, but enhance instead. Any more detail and they might have drawn the eye away for a moment, to examine their shape for something familiar or interesting, and this tiny bit of distraction or curiosity, especially without finding anything of interest, could have lessened the impact of the image and thus should be excluded. Do you have the whole mood and feeling firmly fixed in your mind now? Good. Because now I tell you that anything could be right outside the frame to the left, but it doesn’t exist for the viewer if it’s not included… unless I mention it. Now, you’re wondering, aren’t you? And the mood has changed for the image. That’s kind of what happens when you have distracting elements, only the viewer never felt that mood in the first place. So choose your elements wisely, look around the entire frame before tripping the shutter, and ask yourself what each item in the frame does for your composition. A mostly empty frame really is okay, and sometimes far better than a full one. First off, I’ll give credit for the idea of this post to Carl Sagan, and most especially his book, The Demon-Haunted World: Science as a Candle in the Dark. I cannot recommend this book enough, and not just for those who pursue critical thinking – it applies to anyone, and makes the reader aware that there are lots of ways that we can be fooled. Moreover, Sagan has one of the best approaches I’ve seen, and is an engaging writer for any mature or semi-mature reader. I have been planning a book review for some time, and this may appear here eventually, but don’t wait for me. All right, since I talk about photographing small subjects pretty frequently, I figured it was about time to introduce you to some of the tricks. You’ll find that most of these, with some variations, are practiced by anyone serious about macro photography, and if you have any desire to start doing this, you should know what it is you’re getting into and why some of these techniques are used. 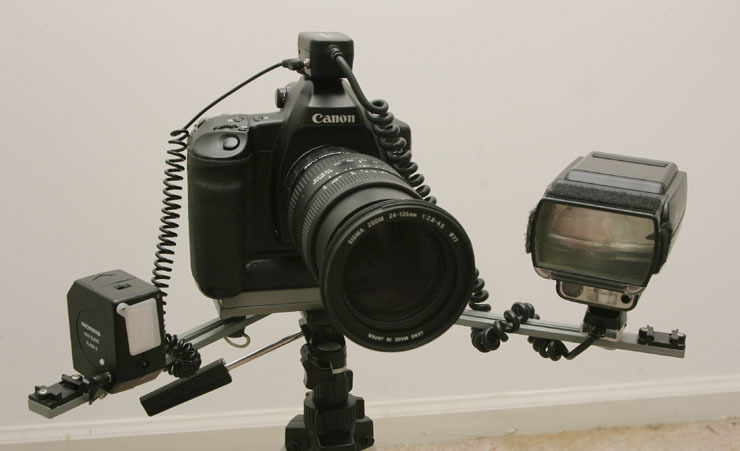 Above is my typical macro rig, which can be handheld or put onto a tripod. The key feature of this is the Bogen/Manfrotto 330B Macro Bracket, seen here in grey supporting two strobe units on either side of the camera. The primary reason for this is that subjects at extreme magnifications are often very close to the lens, so a standard hot-shoe mounted strobe is aimed way too high to illuminate a subject only centimeters in front of the lens, and may even be blocked by the edge of the lens itself. The second use for this is to provide lighting that is not direct into the subject, which often looks unrealistic and doesn’t show detail, especially textures, very well. A little indirect lighting can appear much more natural, show shapes and textures, and even give some definition from the background with a shadow. The second strobe unit provides a little fill-flash, as it’s called, which basically means some light to soften shadows that get too harsh. Roughly half of the time I shoot without a second strobe, but there are times when it’s needed for good results. The strobes are necessary to counteract an inescapable trait of macro photography. At high magnifications (and this applies to telephoto work as well,) depth-of-field drops down very low. Depth-of-field is the range of acceptably sharp focus that extends in front of, and behind, the point you focused on. This means that if you focus on the eyes (and you’d better!) the hind end of the body may be out of focus, unless you take some steps. 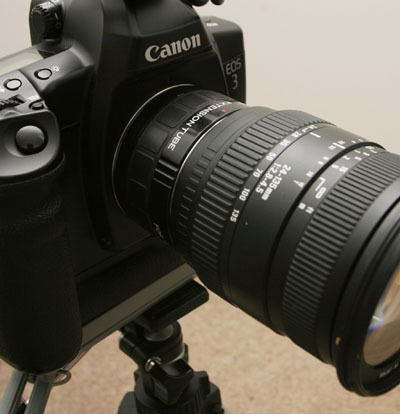 The main one is, use a smaller aperture like f16, which increases depth-of-field. But like everything in photography, there’s a tradeoff, and in this case it means you just reduced the amount of light coming in to the film or digital sensor. To counteract that, you can leave the shutter open longer, not recommended because you’ll either shake the camera or have your subject move during exposure, or you have to produce a lot more light – hence the strobes. The bright light that they put out, however, can cause harsh shadows and let the background, if it’s significantly behind your subject, fall into darkness. 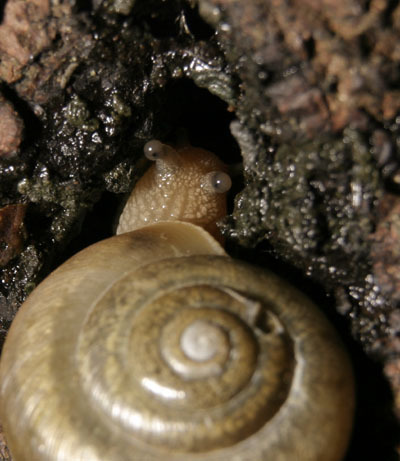 In this tight crop, note that the eyestalks of this snail are sharp, but the shell is already well out of focus – note also the shadows that give shape and depth to the snail and the tree. The macro bracket allows you to position the strobes where you need them, and mine is modified with the addition of two tripod-size screws on the arms, both shown holding my strobes. This gave me some more flexibility in placing and angling the strobes, and was a simple modification. 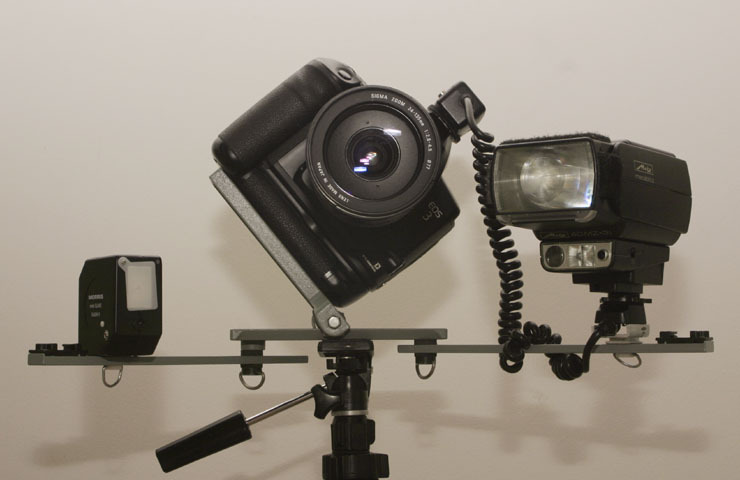 The strobe to the right (larger one) is my main unit, and is connected to the camera by a cord which allows full communication for balanced, accurate lighting. I highly recommend having one of these cords, though Canon needs to increase the sturdiness of this ridiculously expensive cord. Mine has been repaired (see the grey base under the strobe) due to the failure of its cheap plastic construction. On the other side is a basic slave strobe, so called because it can be fired off by sensing the light from the main unit, so it can flash simultaneously without needing any connection at all. For illustrative purposes in the top photo, however, I have it connected via a PC plug that I added to Canon’s off-camera cord, at the top of the camera. This tends to be more dependable – the slave function can miss sometimes depending on ambient light. Here’s another view of the bracket, showing some of the versatility. Both side arms can be adjusted in angle, including simply moving them out of the way, and the camera mount itself has an additional arm that allows you to switch to vertical orientation without moving the strobes – alternately, you can angle the strobes vertically while shooting a horizontal layout, whatever your subject demands. Bogen/Manfrotto is not the only company that makes these, but I liked theirs because of the size it can collapse into. When your camera bag is bursting with accessories, the smaller, the better. Another benefit of a second strobe on its own arm is that it can be used to illuminate the background beyond the subject. Exposure is relative. When using a small aperture as I mentioned above, and thus needing a lot of light from your main strobe, this means that the ambient light is less in relation to the strobe, sometimes a lot less. So what happens is your background drops into shadow, or even total darkness. Sometimes this is fine, but the effect it produces is to seem like you’re shooting at night, and takes away any usefulness from having an appropriate background. So the second strobe is aimed beyond your subject to account for this. No macro work is complete without a good lens that can focus on close subjects. Nearly all camera and lens manufacturers make dedicated macro (or “micro” for Nikon) lenses, and these are often the sharpest lenses you can find and typically allow for a wide aperture to focus on difficult subjects. You will virtually never shoot at these wide apertures, because of the depth-of-field issue above, but when you get close to something interesting and focus is crucial, you often need the light. But there are two other ways to get close focus capability as well. One is with diopters, which are “filters” that mount to the front of an existing lens and change its focus. These are inexpensive, but typically produce less than exciting results, most especially with edge distortion. They work in a pinch and can be a cheap way to get started, but if you’re serious enough to use a bracket, you need to consider something else. The second way is with extension tubes, which are much simpler than their price seems to indicate – they’re simply empty tubes that extend the lens further away from the camera. You can see the tube here between the camera and the lens, flanked by silver edges. They work exactly like moving a projector further back from the wall – the image gets bigger. It also gets darker, because the lens is optimized for a certain distance from the film/sensor plane and moving it further back diffuses it more. Extension tubes are only as good as the lens mounted to them, and here’s where I made a pleasing discovery. When my dedicated macro lens started performing sporadically and needed repair, I tried a general purpose lens, my Sigma 24-135 zoom, on an extension tube, and it performed better than any expectations. This will not always be the case, and sometimes you won’t get sharp results with tubes, but they’re also typically 1/4 the cost of a dedicated macro lens. You will lose the ability to focus at distances, but this isn’t much of an issue since they snap on and off in seconds. There is no reason to spring for expensive ones – the inexpensive set of three Kenko tubes I’ve been using for the past decade still appear like new and perform without issue. However, I will say that dedicated macro lenses are the best performers and worth the money, though you don’t always have to get the OEM models to get great results. And finally, one other little contraption that I made myself. This is a softbox strobe extension that positions the light directly over my macro subject, but diffuses the light to appear less like the spotlight effect that the strobe produces by itself. 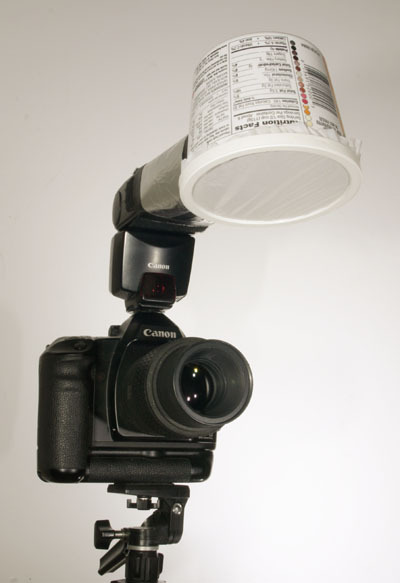 It allows softer, ambient-appearing light to be right over a subject only centimeters in front of the lens, and really is a reflective tube, a reflecting plate at an angle within the drum (a pudding container,) and a piece of plastic grocery bag as the diffuser. You can tell me how well it works by seeing both photos here and the second photo here. 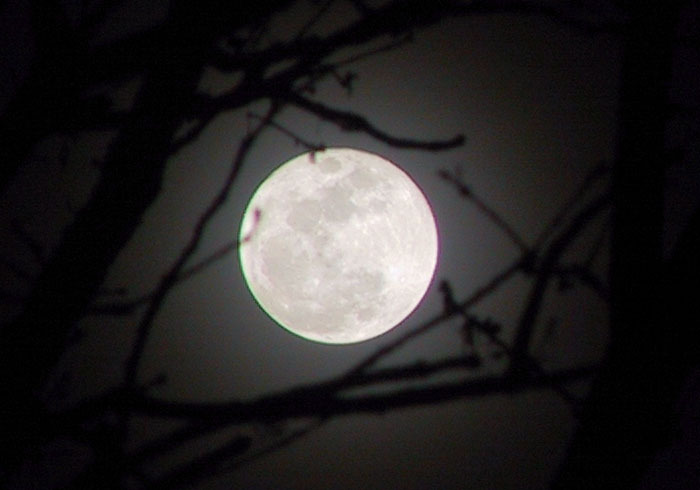 All were taken late at night with no ambient light (I focused by flashlight.) Notice the softness of the shadows that gives the appearance of full daylight. There are plenty of flash diffusers available for purchase, but none that I’ve found would move the light to above the subject like this one does. So is all of this necessary? Well, it depends on your subject, but being limited in what you can do will limit the images you produce. Having the strobe’s light cut off by the edge of the lens will trash the photo entirely, and attempting to juggle a strobe held in your hand, while trying to focus on a tiny subject, is more headache than it’s worth (I know, I’ve tried – I’m trying to save you some of the frustrations I’ve had with all this.) Inadequate light or too-harsh shadows also don’t work very well. If you want to tackle little subjects, sooner or later you’ll end up using a variation of what I’ve described here. Hopefully I can save you a little trial-and-error. Now, for an example of someone whose work puts mine to shame, check out Igor Siwanowicz’ work at Blepharopsis. He’s gotten past the background darkness issue in most cases, and you can see one of his working rigs on that page. He’s got a big softbox on the strobe to the left of the photo (mounted on, you may note, a Bogen/Manfrotto 330B) and another strobe with diffuser to the right, mounted on its own stand – both appear to be illuminating the beetles. It’s possible that there are more lights covering the background, not seen in the frame. It’s not a portable rig, but it also produces stunning results – such effort can mean the difference between fantastic art and, well, my work. Again, there’s nothing that says you have to do any of this, but if you’re wondering how to achieve certain results, now you have some idea. One of these days, I may start a new series of posts regarding compositional elements, because there are a lot of them, and knowing what they are can help you structure images instead of simply capturing them. But there’s a problem with this, because teaching composition is tricky – there are no rules, no formulas to follow every time. And many of the compositional elements that appear in my images are used because they appeal to me, and my (if you’ll pardon the phrase) artistic standards. I never want to bog people down with more photographic mumbo-jumbo, since there’s enough already in simply understanding how the camera works, and compositional elements are merely descriptions of something that “works” for our aesthetic sense. But for now, I’m simply going to talk about the ugly stepsister of composition, cropping. This is an example image I took a few years back, and almost discarded. It was a grab shot as a pelican launched itself away at my approach, and the color in the original is truly hideous. But when I converted it into black & white and tweaked the contrast a little, it became much better. Then, I cropped it down to the horizontal composition you see here, from a frame that was probably 20-30% wider. Shooting animals from the back only works in limited circumstances, because as humans we prefer to see faces, and backs are, to us, a rejection. But here, it sends a message of heading out over rough seas, of isolation, and potentially of challenges ahead. I can’t be sure, because I know what conditions this was taken in and am thus biased, but the position of the pelican’s wings might say something about gusty winds, and the contrast may give the impression of overcast skies. Into the teeth of the gale, as it were. 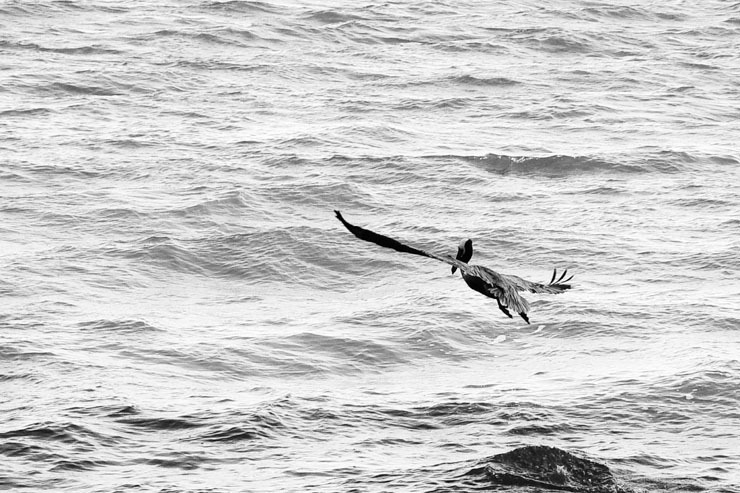 I cropped to position the pelican at this point in the frame, with the wings working a line between opposite corners, something I’m fond of. The blotch at lower right, directly below the pelican, gains the appearance of a rock, and the legs and head position seem to say the pelican has just launched itself from there. It hasn’t, but in photography, what is actually the case and what the image seems to convey can be two different things – accuracy is not a necessity. I included enough empty space around the pelican, especially above it, to communicate its isolation and to give it “space to move” (an important element for moving subjects,) and while the portion of water in the frame isn’t significant, it’s empty enough to serve the purpose. There’s not much more to be said than that. And now we see a different crop. More of the waves below the pelican become visible, and these have an even rougher feel, and slightly confusing. Now we know we’re not dealing with a rock underneath, but the distinct shapes almost seem recognizable, and the viewer may take a moment to frown at them before deciding they really are just waves frozen in time. But in this crop, they have become an element of the scene, almost a subject in themselves. Notice, now, that the lack of space ahead of the pelican takes away the idea of the beginning journey. 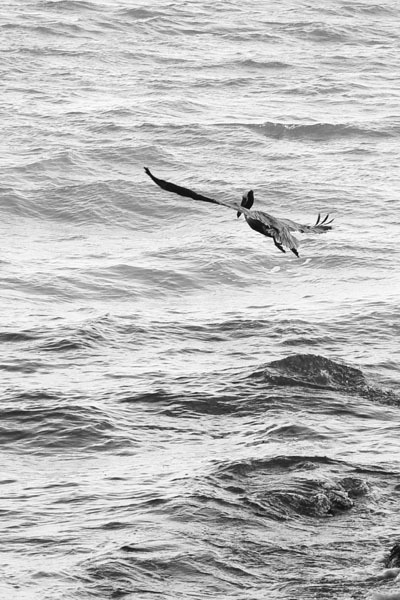 Instead, the pelican being higher in the frame causes it to soar above the angry waves, untouched by the turmoil below. There’s even a break in contrast, occurring just underneath the bird, that mimics the ground and sky – and the bird rides firmly in the sky, brighter and by association more welcoming. The vertical composition lends emphasis to height, as opposed to a horizontal which, of course, emphasizes a broader expanse, more of the open horizon, even with no horizon visible at all. So now, we don’t have a perilous journey like we did above, but the emotional idea of soaring above the turbulent, dangerous water. Both from the same photo, dependent only on the elements included and where in the frame they fall. The top composition has one subject, the pelican, in a setting that evokes condition. At bottom, there’s two subjects, the pelican and the angry waves, and these are selected and emphasized by the crop. And there’s a more subtle lesson in here, too: don’t frame too tightly when taking the original photo, because you may eradicate useful elements or take away opportunities to reframe for a different emotional perspective. In fact, whenever you can, shoot a variety of layouts of a compelling subject, using your zoom lens to good advantage. So, which is better? Well, that’s really up to the viewer, isn’t it? They might identify more with one emotional message than another. Your choice as a photographer is to decide if you want your own vision and message to be the only one the viewers see, or if you like the idea of seeing which one of several gets a better response from people on average. I’m fairly good about switching from horizontal to vertical layouts as I shoot, depending on what I think the subject warrants. But I’ve also, like in this case, tried switching after the fact and created some really interesting effects from experimenting. One more thing. For typical sales, like to individuals for decorative purposes, you’re often much better off sticking to an aspect ratio that matches common frame sizes, so people can easily fit your image into an 11×14 frame, for example. This can be limiting. Many published sales don’t have such restrictions, except for cover shots, but it’s often better letting the editor do the deciding, and simply sending the entire image. If you’re framing your own, be it for a wall-hung print or on a website, you have the ultimate freedom in choosing an aspect ratio that works best for the image. Both images above are roughly 2×3 aspect, which works for very few commercially available frames – it’s equal to 8×12, or 11×16.5 inches, neither a common size. Trimming the image, of course, changes the purpose of the cropping to some extent, so it has to be done judiciously – or you include a custom-cut mat (not a bad idea.) Just something to bear in mind when doing your cropping. If you look around the site, you may be able to recognize how the elements fit into the frame and what I was after. Most are cropped to some small extent, specifically to emphasize the elements I chose. It’s a tool that can do a lot for your photos. So how does one ‘compose’ an image? Phil Plait over at Bad Astronomy, in recognition of Caturday, posted a photo of one of his icks, so I had to throw up (heh!) this recent photo that I took. I’ve never had an issue with mantises, and can usually handle them without too much difficulty. This one stopped for a quick brush-up while wandering on The Girlfriend’s hand – the pink form you see at lower left is her thumb (so don’t say I’ve never included a photo of her.) The fun part about mantises are their eyes – the black dot, while appearing to be a pupil to us because we expect one, is not anything of the sort, since praying mantises have compound eyes and see in many directions at once – both The Girlfriend and I are clearly in sight to the mantis in this photo. Instead, the black dot is a diffraction effect, and I think it actually indicates the part of the eye that is most flat to the observer. I’m trying to determine this for sure right now, but haven’t had it confirmed yet. This leads to lots of speculation that it’s a specific “eye” trait, like those displayed by some butterflies and caterpillars, that makes predators of mantises feel they are facing something dangerous – well, more dangerous, like an owl or snake, but seriously, do mantises need it? They seem to be quite capable of handling themselves. I originally wondered about it disguising the reflection from the sun, thus avoiding cluing in a potential meal with the shine that plant leaves typically don’t have, but this doesn’t fit, since the surface that reflects sunlight is not usually the one closest to you, but at an angle between you and the sun. As seen here, both the sun and my flash throw their own white spots on the eyes. I’ll have to see what I can determine. 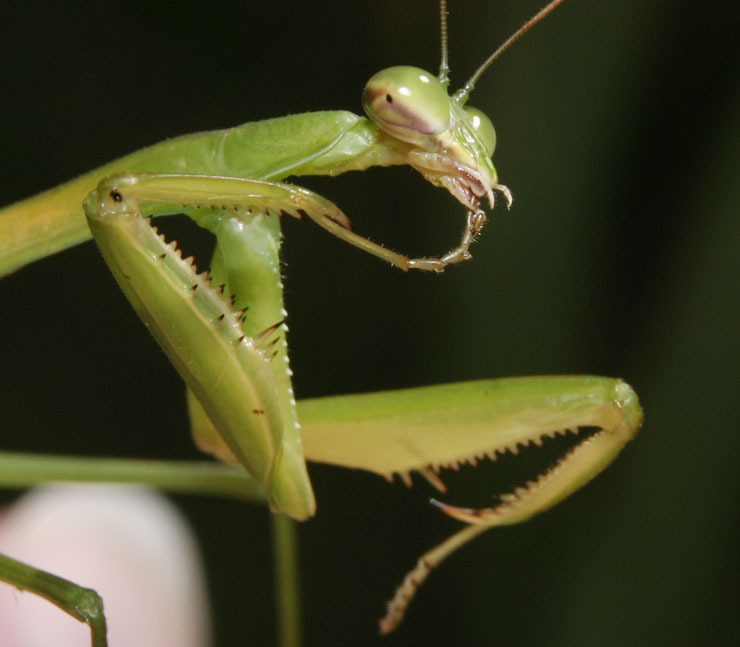 I always considered it “preying” mantis, by the way, but it seems this is not usually the case – it’s the shape of the forelegs, not the ability to eat any damn thing that moves, that provides the name. I have bigger issues with spiders, myself, something it’s taken me a while to reduce, and it’s not fully gone yet. The big ones won’t be perched on my hands (or The Girlfriend’s) for a photo anytime soon. [Sniff] They grow up so fast! I have no idea what tree it is, since I’m lousy at botany (or arbory or whatever,) but it’s the same one seen here and here – hey, some trees are handy for photo subjects. I just know that when I’m lost in the woods struggling to survive, I’ll avoid this one if I want to keep my svelte figure. Meanwhile, I have some eggs to keep an eye on to try and capture the emergence. 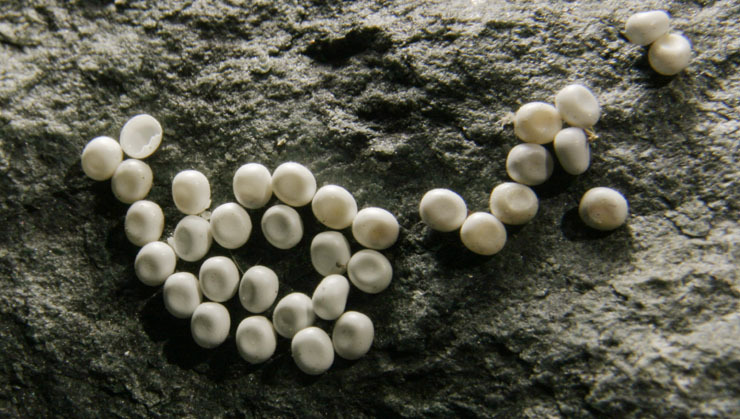 I have no idea what these are either, but they’re rather prominently displayed on a rock, so their tiny size (maybe just a tad larger than a pinhead) might not be enough to let them get to hatching. Living on the edge of the woods is a good thing. For some reason, a small herd of White-tailed Deer (Odocoileus virginianus) has taken to visiting roughly around 2:30 PM some days, and when the temperature is cool enough that I can leave the window open, I can hear them foraging. This one was a little surprised to see someone appear in the doorway so close by, but I wasn’t moving enough to spook her off, and she provided several nice portrait poses. 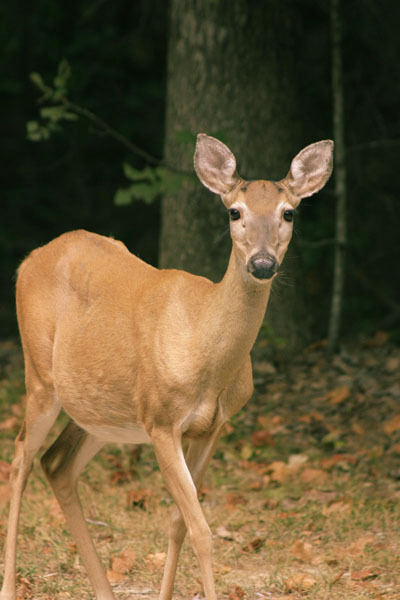 Deer are foragers, rather than grazers, which means they don’t eat grasses like cows or sheep. Instead, they seek new saplings, leaves, vines, shoots, and berries – and on occasion, garden plants and The Girlfriend’s tomatoes and peppers. In this area, they make things a little more convenient for forest wanderers like myself, because they’ll keep “greenbrier” (the colloquial name, I’m not sure of the exact species) at bay, a tough wandering vine that sports large thorns. Greenbrier can quickly turn shaded woods into impenetrable thickets, and makes walking among the trees a chore at times, but deer like it and their regular visits will keep the vine from gaining a firm hold. Yesterday afternoon, I added some water to the thirsty potted salvia I have sitting on my railing, and as the water pooled on the soil surface before soaking in, a tiny face appeared among the leaves, startled by the sudden flood. This began a tortuous session of macro photography, as the juvenile Common Grey Treefrog (Hyla versicolor) did not want to hold still for the giant lens looming in its face, and kept hiding under the leaves. Right now, as I type this, it has ventured out of the pot and is working its way along the railing. This has me a little curious, since both of these species are primarily nocturnal and the days have been unseasonably hot, all the more reason to hole up during the days. 6:30 PM is a little early to see treefrogs getting active – night won’t fall for about another two hours. 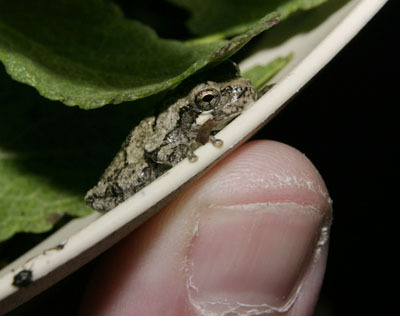 Treefrogs have distinctive toes, ending in a broad and moist pad that lets them cling to vertical surfaces effortlessly. In fact, it can be a little startling to see them jump against a wall and remain there instead of bouncing off. 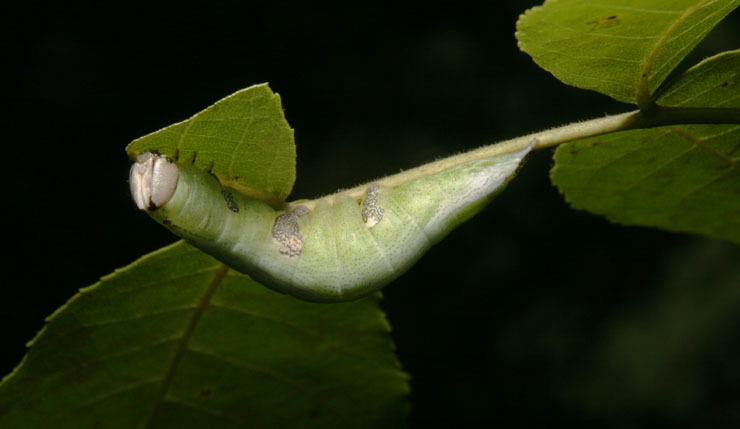 This trait lets them forage for food high in the tree canopies without needing claws, and also lets them scale rocks, leaves, and yes, even people that attempt to grab them. You can get an idea of the size of this specimen by my ugly thumb, included in this shot for scale. I normally see them much larger than this. A conversation with The Girlfriend this evening reminded me of something I hadn’t brought to mind in a long time, so this is simply one of those stories from my past. I doubt that it serves to help explain why I’m the way I am, but I’ll let you be the judge of that. In 1991, I had moved to North Carolina exactly one year before, which I can say easily because both this event and the move occurred on my birthday. I had, after a false start working for an idiotic local printer, begun working for the local humane society, which ran the animal shelter (see here for a related story.) Among many other services, the shelter performed emergency animal rescue work in the off hours, nights and weekends, which is where I actually started. I’m not sure what made me acquiesce to working on my birthday, but this was just one of several events which made me resolve never to do this again. It took a few more years to solidify this resolve, though. At that time, I was working a full-time shift at the shelter and then going “on call” for rescue work, usually one night a week. We had the whole schmeer: a fully-equipped van, pager, and mobile phone – “mobile” meaning, in 1991, almost a carryon bag by today’s definitions, roughly seven pounds and stored in a case with shoulder strap. Virtually any animal call was our responsibility, within the entire county, so some nights were fairly busy. This particular evening, I had received a call about an injured raccoon on campus at the University of North Carolina at Chapel Hill, quite close to where I lived, and I headed out in the early evening downpour to see what the situation was. The raccoon had decided to seek shelter in a tree, and I was directed to the right one by the caller, otherwise I would likely never have spotted it. I was unable to see how mobile the critter was, and thus gauge the extent of any injuries, so I gathered a likely collection of equipment and started climbing the tree – luckily, it was a longneedle pine of the type so prevalent around here, with plenty of branches to assist the ascent. But this was perhaps the easiest part of this task. Raccoons, to fill in the uninitiated, are actually fairly dangerous wildlife to handle, close to the top of the list for species around here. 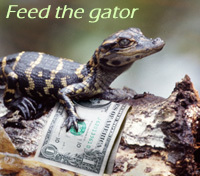 They’re aggressive when threatened, afraid of very little, and pack a lot of agility and a mouthful of sharp teeth. Even the heavy leather welder’s gloves we used for animal handling were insufficient to protect one’s hands from a determined bite. Usually, we used a net to capture animals like this, deep and broad like the landing net that fishermen use, but heavier material. Climbing a tree, however, meant that this would only be in the way, and I’d unlikely get a decent sweep anyway. So I was heading up with only a set of gloves and a small cat carrier strapped to my belt. I was realistic enough not to imagine this was sufficient equipment for the task, but what was I going to do? The idea was to either quickly scruff the raccoon, grasping it by the loose skin on the back of the neck where it (probably) could not reach me, and bundle it into the carrier; or, if it was close to incapacitated, coax it backwards into the carrier itself. Neither one of these filled me with confidence. It was still raining, and the sun had set so twilight was fading fast. I wear glasses, so it was only a minute before I was looking through a combination of distorting water droplets and fog – I’m far too nearsighted to remove the glasses and have a better go without them. It was still warm, which helped, but this doesn’t mean much when the water is running down your back and into your pants. I got close enough to the raccoon to see that it was only limping, able to scoot easily away from me in the tree, and not happy with my approach – trying to get it would have been next to impossible, very dangerous, and probably unwarranted from the nature of its injuries. Wildlife medical care is a little tricky, because you have to balance the help you can provide with the mental state of the animal while you provide this care. Virtually no animal is going to benefit from bandages – they’ll be torn off in minutes. While handling it, and during a captive convalescence, the animal is going to be highly stressed from proximity to people, which isn’t a good thing to induce. And maintaining a full round of even antibiotics would mean ten days of captivity, during which it may not even want to eat, which will not help matters any. With an animal displaying no open wounds, no bleeding, and merely a limp, it can actually do more harm trying to treat this than simply leaving it be. And that was my decision. When I looked down to begin descending, however, I got the chance to reflect on choices a little more. I was already using my birthday evening to climb trees in the rain, and now I found I couldn’t see well enough in the fading light to spot the branches which I’d need to get down. The descent was a mixture of shaking my head madly to try and clear the glasses a little, and swinging my legs while letting myself down gingerly, until I chanced upon a foothold. Getting down took twice as long as climbing up, but I made it without having to spend the night. I was soaked, scratched from branches, and long overdue for dinner, much less any celebration. Doing animal rescue usually means a certain mindset, ignoring personal comfort and convenience in favor of helping animals in need, but this doesn’t mean you won’t look back and wonder what the hell you were thinking at that time. It’s also a little disturbing that this was nineteen years ago. A lot has happened since then, but I’m betting I can still find that tree on campus.